Selizo A4 size ultra-thin portable LED light box tracer with 3 level adjustable brightness level is made of durable transparent acrylic. The light emitted from the pad through the paper presents the images more clearly and makes tracing images easily. Via USB Powered, DC 5V, 3.2W: it supplies with a USB cable and can be plugged into any device with USB port, such as computer, power bank or any 100/240V-50HZ power adapter(not included) that connects directly into a wall socket. It's the necessary tool for artist friend. 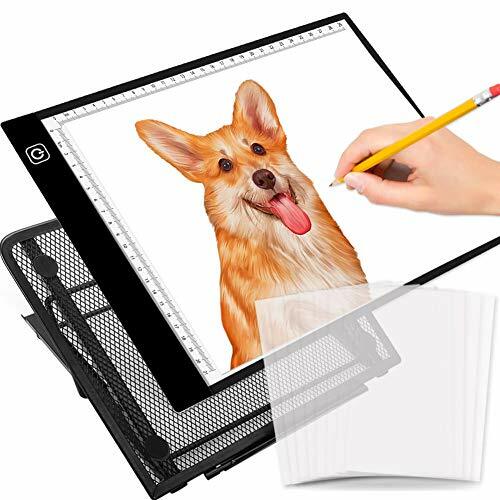 Value pack with portable light pad stander which is not only for light pad but also fits laptops, iPad, tablets, notebook, diamond paintings to provide you a sturdy and comfortable position for working, reading and crafting.